Set in northern Uganda, Enduring Exile uses visual imagery and storytelling to explore the logics through which South Sudanese refugees endure exile. By documenting the daily lives of the displaced, Enduring Exile presents an alternative narrative to the commonplace representation of refugees as “victims” while restoring the local experience of refugees that is often silenced by an explanatory industry based on statistics. Every month, a group of South Sudanese refugees gather at a crumbling, one-story church in Arua, Uganda for the Prayers for the Healing of South Sudan (PUSH) service. Packed shoulder to shoulder in a small, mud-walled church, worshippers at the Ambiriombachi Anglican Church in Arua shouted prayers for peace and reconciliation in South Sudan. 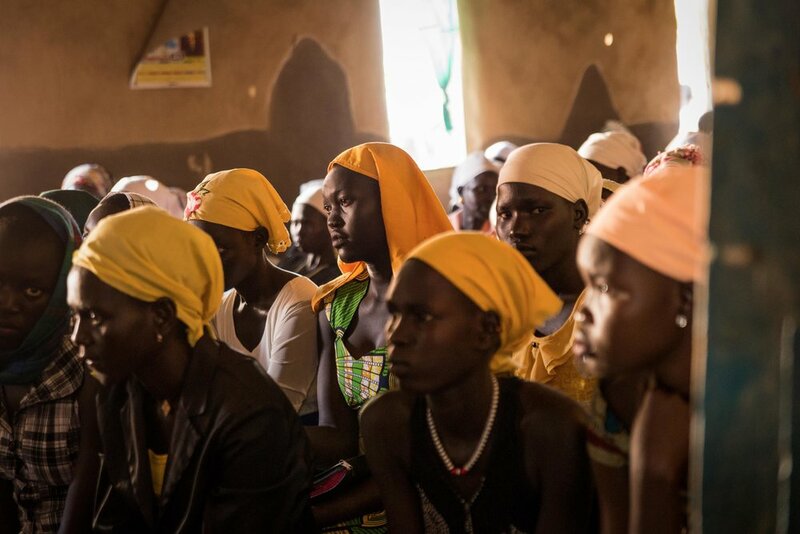 The service was conducted in Dinka language for a predominantly female congregation, who swayed back and forth to the repetitive rhythm of hand-beaten drums and traditional South Sudanese song and prayer. Worshipers at a Dinka church in northern Uganda gather for Sunday service. More than 330,000 South Sudanese have fled to Uganda after fighting between the Sudan People’s Liberation Army (SPLA) forces and rebels intensified last July. Both groups are accused of perpetrating human rights abuse against civilians in the South Sudanese town of Yei including killings, rapes, arbitrary arrests and forced abductions according to Human Rights Watch. Dinka men wait outside the church in Arua, Uganda. Several avoided being photographed for fear they could be targeted for violence by soldiers loyal to Vice President Riek Machar, an ethnic Nuer.